The following information is a quick 'at-a-glance' compilation of just some of the useful things you may wish to know about Wangford. You may also wish to consult the Wangford Village Map, which gives street names and the locations of places of interest. Clerk to Wangford with Henham Parish Council. Bus stops throughout the village with services to Southwold, Lowestoft (East Suffolk Line train station), and local villages. For general local travel see the 'Travel Information' section of our Useful Links. Millfields, Wangford, Beccles, Suffolk NR34 8RG. Wangford Community Centre, Millfields, Wangford, Beccles, Suffolk NR34 8RG. Tel: 01502 578062. (website). To see details of events in the local area please see the Blythweb Calendar. Longshore Doctors Surgery, Church Street, Wangford, Beccles, Suffolk NR34 8RN. Tel: 01502 578257. The British Red Cross Medical Loans service for Southwold and area, contact 07595 279310. Alternate Fridays during January – September. Every four weeks on a Friday during October and November. Millfields, Wangford 10:25am – 11:25am. Church of St Peter and St Paul, High Street, Wangford, Beccles, Suffolk NR34 8RL. Wangford Post Office, Millfields, Wangford, Beccles, Suffolk NR34 8RG (at Wangford Community Centre). Open Tuesdays 10am – 12pm and Thursdays 1pm – 3pm. Bins for various items located at Wangford Community Centre, Millfields, Wangford, Beccles, Suffolk NR34 8RG. 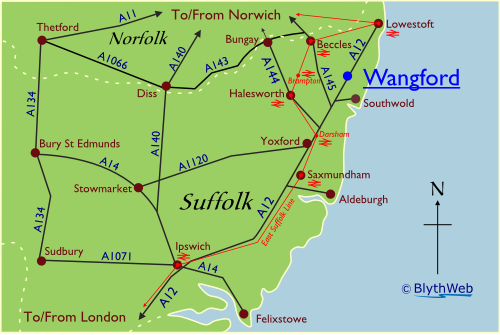 Sustrans Regional Route 31 crosses the A12 just to the north of Wangford from Southwold and eventually connects with Sustrans National Route 1 (Dover - Shetland Islands). All stations are on the East Suffolk Line (London Liverpool Street - Ipswich – Lowestoft). See also the 'Travel Information' section of our Useful Links. Should you need more information on anything mentioned here the Parish Clerk should be able to assist. and any errors or omissions are regretted.